I keep thinking about last night with my missional community. There are eleven of us, and though I was previously convinced we were the random hodge-podge group created after all of the logical combinations were made, I now see that God knit this unique group of women together. I am so grateful for their stories, their honesty, their encouragement, and their authenticity. 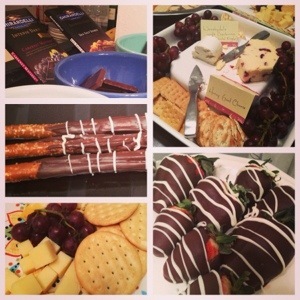 Here’s a collage of the spread last night– it was wine, cheese, and chocolate night– woohoo!!! !